"This refreshing summer salad is quickly prepared and always pleases a crowd. I like to eat it cold." Place the chicken in a baking dish, and roast 25 minutes in the preheated oven, or until juices run clear. Remove from heat, cool, and cut into bite-size pieces. Bring a large pot of lightly salted water to a boil. Add farfalle pasta, cook 8 to 10 minutes, until al dente, and drain. Cool to room temperature. In a large bowl, mix the chicken, pasta, shrimp, olives, tomatoes, carrots, and cucumber. Toss with balsamic vinegar and feta cheese, and season with salt-free seasoning blend. This is a very good summer type salad. I used Italian dressing and only used the shrimp. It was very yummy. 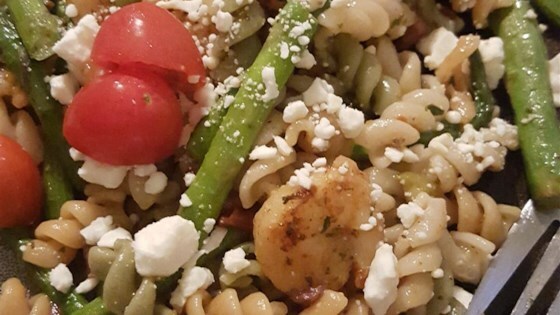 This was good, but it could have used a little more shrimp and feta, in my opinion. I used 16 oz. chicken and that was the perfect amount.